Ingredients: 250g fettuccine, 400g radicchio, 8 artichokes, 1 small onion, 200ml cream, grated Parmigiano Reggiano cheese, extra virgin olive oil, salt, pepper. Preparation: Cut artichokes in pieces and put them in a bowl with water and lemon juice. While they are boiling, mince radicchio. 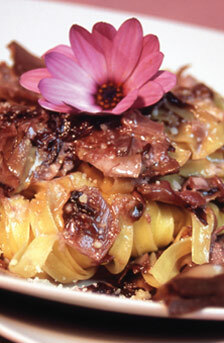 Chop onion in thin slices and let it brown with some olive oil, then add the boiled artichokes and the minced radicchio. Let all cook for almost 15 minutes by low heat. If necessary, add some hot water. Add cream and after 1-2 minutes turn the fire off. Boil Fettuccine in abundant salted water, drain them "al dente" and flavour them with the sauce and sprinkle with Parmigiano Reggiano cheese, then serve.